My favorite genre picks from this past year. The most action-packed was a fan film tribute to cyberpunk classic Deus Ex: Human Revolution. One with surprisingly high production values. While it starts out too slick and Hollywood, there are unexpected reversals and some fluid choreography, as well as well-developed tension in the final third. Fortress, by Dima Fedotof, delivers chilling moments in a conflict that has long since taken on a life of its own. "The Great Martian War". A music video rather than a short film, but one with good War-of-the-Worlds style imagery, as well as solid visual storytelling. Imagine discovering that your father murdered history. Scattered, by Joshua Bergman, is a multi-leveled father - son confrontation over the meaning of the past, as well as growing up. It's also about how old collisions between cultures define our present, and the possibilities of using new technologies to erase the raw material of history in an attempt to save humanity from itself. What would this cost us, and what might it gain us? I've got mixed feelings about Chris Caldwell and Zeek Earl's short, Prospect. On one hand, it feels like a film without an ending. Or at least there's not enough set up for the fade out. On the other, the first ninety percent is a solid story of risk-filled exploration and resource exploitation on the cheap, as experienced by a father - daughter team on the frontier of human space. Exit Log is an interesting take on the effects of advanced space flight technology on time. Shades of Akira in this bleak, but intense and well-shot short, set in rural Australia. Yardbird and the previous pair of films capture this year's trend of rising cinematic quality in short films, combined with the ongoing dourness that has been apart of literary science fiction for the past two decades. By Bridle Path Films. Antarctica, free of ice. Now home to humanity and questions of love, identity, and organic and synthetic life. Yes, the couple is a little too lovey dovey in their home videos. And as always, the automated house of the future is a shade too cheerful and in-your-face helpful. Thankfully, the underlying conflicts in Similo are more interesting and complex than a dystopian reveal. Rather, this is a story of ongoing adaptations to a changed planet and evolving technologies, and it delivers a hopeful ending. Also, one of the more arresting films in terms of sheer visual beauty. NSFW. My favorite short from last year was by scientist Xiangjun Shi, who used her illustration skills to depict her love of physics -- the mathematical poetry of our universe. As much as I deeply enjoy science fiction, the genre is often hard pressed to evoke the same level of wonder that the study of the real world's underlying mysteries so often does. Which is probably why some of the most influential genre fiction ties into science and history to produce an impact that pulp can seldom match on its own. It's also why this year's favorite, Wanderers, is so engaging. The past decade and a half have been a gorgeous period for imagery when it comes to celestial and extraterrestrial photography. Each week seems to bring us new high-resolution photos of other worlds and heavenly bodies. Erik Wernquist transforms some of these images into settings, layers a classic Carl Sagan voice track over them, and fuses all this goodness with stellar CGI. In doing so, he summons up the sense of awe that only exploring our parent star's domain can evoke in a species of once and (hopefully!) future nomads. Electronica and ambient is to my generation of music geeks what serious jazz was to our predecessors. The post-rock, post-pop, post-alt music of a non-mainstream adulthood. My favorite discovery of the year: Christian Löffler, via Questionable Content author Jeph Jacques. In particular, Löffler's Young Alaska. A sublime standout, even in a year that saw an unusual number of artists mixing energy and subtly in the same tracks. Not that there wasn't rock. My favorite tracks in that genre are found in the absurdly awesome adult vampire romance, Only Lovers Left Alive. Which you should watch late on a quiet Saturday night. At least four or five times each year. Preferably with someone smart, lovely, and eternal by your side. I somehow missed Broken Social Scene's Forgiveness Rock when it came out in 2009. An album which, well, rocks on multiple levels and tempos. When embedding here on the blag, I try to stick with videos posted by the bands or music labels, and which are made available for sharing. However, the official one below is crap as far as sound quality. A much better copy can be found here. One that will let you know why you should buy the track if not the album. As much as I try to avoid the stagnation of nostalgia, I did give into Pearl Jam this summer. A happy reminder of a decade proudly misspent wandering the high country of the Sierra Nevadas or bouncing around the world under arms. Electronic swing. It was a thing this year. An update of the drive and sophistication of a mid 20th century American sound. The darkest sound of the year came in Kangding Ray's Solens Arc. Gothic-cyberpunk. The brightest was found in Lone's Reality Testing. The most complex and evolving tracks were those of Andy Stott's Faith in Strangers. I came across an amazing psych-rock track early in the year while knocking about the the interwebz one rainy morning. Somehow cheerful and ethereal, which had appropriately enough been used to help eulogize an insanely talented young creative who worked in kinetic sculptures, robots, and puppetry. A woman who died way too young in an accident last year while hiking in the mountains near her home in Colorado. It was a good years in music. And an amazingly productive one for me. One in which writing and other applied arts turned into a decent-paying profession. One that mixes content creation with software and library management skills. Along with more travel in the coming twelve months, what I'm most looking forward to is putting a whole lot more time into genre writing, and scoring more publications in science fiction and, maybe, possibly, with a fantasy title. This is a bit of a Gedankenexperiment concerning the nature of technological revolutions and the future of employment. You find yourself in Great Britain sometime in the mid 1800s. You're trying to explain the concept of what a computer game developer does to a soot-faced miner fresh from the coal pits. You're doing this because the miner has asked about his descendants. In the present, your point of origin, that would be his great, great, great grandson, the developer. Can you pull it off? Not just tell him what a computer game is, but get the miner to understand what a game developer does? Just how many basic concepts do you need to convey to do that? How many ideas underlie what a computer is, what people use them for, and what a first person shooter or real time strategy game is, let alone the generalities of how someone actually makes a living working with software abstractactions that are almost theological in their degree of removal from the physical world. How many conversations would this take? How many digressions into related topics such as, electricity, simulations, and programming languages? What about the very nature of a society that supports gamers and developers? Imagine explaining to the miner that ordinary workers in 2015 have a dozen or more hours of potential leisure time each week. Could you convince a man who works twelve-hour days for months at a time that this is true? Bear in mind you're trying convey all of this to an inquisitive, but unlettered individual who started his working life as a farmer laboring in fresh air under the open sky. Who, like so many others, now lives in a squalid tenement and works in a uniquely claustrophobic hell beneath the earth. All to provide fuel to factories that are slowly transforming every aspect of life, from clothing, food, the nature of work, gender relations, education, and the practice of religious faith. This change includes the famous "annihilation of space" brought about by the coming of rail roads and telegraphs. Between this miner and his great, great, great grandson in present day East London -- the descendant downing espressos at his ergonomic workstation in a climate-controlled office -- lie almost two centuries of transformations. Radical social movements, cataclysmic wars of staggering size, European colonial imperialism, regulatory implementation, labor reform, and the emergence of weapons of mass destruction poised on a hair-trigger alert that continually threaten humanity's existence for half a century. The Event Horizon of Futurism? Now imagine you're in an East London cafe having coffee with the game developer's great, great granddaughter who's traveled back from 2215. Gratified by your enthusiasm for relating her family's history, she is patiently trying to describe the basic concepts underlying her work in a field that doesn't exist yet by your frame of reference. Employment and a mode of labor that depend on the emergence of industries founded on scientific and engineering concepts yet to be formulated. What kind of new mode of employment? Maybe something like machine-mediated periods of lucid dreaming that allow her to create efficient and intuitive data architectures for whole bodies of knowledge, any one of which dwarfs the sum total of all accumulated human knowledge in our present. That, and she can create a complete set of such functional structures in the course of a single work week. Or maybe working with data on a scale that beggars our imagination falls woefully short of what she actually does. Perhaps she deliberately dream-generates libraries of novel space-times. The differences between these continua create forms of information potentials, the uses of which are beyond the ability of un-enhanced baseline humanity to comprehend, let alone work with. Between her time and yours are vast social upheavals and wholesale transformations in the way people and machines conceptualize the world. All the same, her work is ultimately is rooted in your now. In the present day emergence of cloud-based practical AI routines that inject pattern recognition, language-parsing, deductive reasoning, and advanced machine learning into consumer apps and enterprise applications. In the emergence of mobile computing in platforms like smartphones, which in just a few decades will each possess processing power and memory equivalent to that of a human brain. It'd hardly come as a surprise if your visitor from the future described how these developments go on to destroy employment as you know it. Then remake it after decades of chronic 1800s-style depressions, recessions and mass un- or under employment. Sadly, the descendant of the game developer is fictional, at least for the time being. Likewise, the future reality of her employment is likely beyond our ability to make accurate predictions about. So maybe we can sketch the broad outlines of the future of work, twenty or thirty year ahead, instead. Just like our miner would have a much better chance of imagining Britain somewhat accurately circa 1880 rather than 2015. Or maybe the video game equivalent of meth for someone like me. Either way, something I'll binge on for two or three weeks during the dark and rainy month of January here in the Pacific Northwest. Then delete. Otherwise I will never write anything again. It’s hard not to go numb when reading almost any history of the Soviet Union from the 1920s to the 1950s. The number of atrocities famously curves upward from the level of human suffering into emotionless numbers. Montefiore’s eminently well researched, Stalin: The Court of the Red Tzar, avoids inflicting such a loss of feeling by staying focused on individual and familial tragedy. What makes this work of popular history so compelling is that the personal intrigues, birthday parties, denunciations, weddings, disappearances, evenings of cinema, torture, and ever-increasing fear or debauchery, all play out in the small but cliquish circle of families who ruled the Soviet Union during its darkest years. Then there is the fragmenting humanity of the man who dominates them all. As they rise in power, fall into exile or prison, are 'rehabilitated', or meet with the executioner’s bullet, none of the magnates, children, wives, or extended families of the Kremlin can escape the shadow of a loving father and bereaved widower already steeped in the blood of ten million Soviet citizens by the time Hitler sets the Holocaust in motion. When I was younger, Hitler was my personal embodiment of evil. "Never again!" seemed like a goal that was both achievable and of dire importance in the aftermath of a catastrophe as unique as the Holocaust. Later, as I traveled the world and studied history, it became apparent that there were a handful of other totalitarian 20th century rulers who had matched or rivaled Hitler in number of tragedies inflicted. He was just the one that we focused on in the West. At present, the rise of a new set of totalitarian autocrats may seem like a remote possibility. We've almost immunized our cultures against another Hitler, Stalin, Mao, or Pol Pot. We've enshrined Orwell, and popular entertainment feeds us a steady diet of fictional dystopias featuring oligarchs armed with sweeping propaganda apparatuses and panoptic surveillance technologies. There's a reason the Snowden revelations touched such a raw nerve here in the US. Sixty years of film and novels have implanted a deep aversion to unchecked state-surveillance. At the same time, so many have forgotten the origins of the ideologies that gave rise to totalitarian rulers on both the extreme right and left. Communism at its heart was a reaction to the upheavals of industrialization. The economic transformations that forced millions of farmers from their homes into decades of urban poverty, malnutrition, and lifestyles alien to those of the small, family-oriented communities they'd left behind. Nazism and Fascism were the far right answers. Blood drenched responses to communism, and radical attempts to tame the instability of industrial economies. So it's worth our while to look back. Then glance around to see if anything looks uncomfortably familiar as a new wave of technologies challenges our societies in the here and now. Mostly for editing, actually, when working on both technical literature and genre material. For either undertaking, Loscil's new album Sea Island is as close to an ideal background music as I've come across. Sublime, but with enough evolving structure to stimulate. An ambient equivalent of good espresso. Strangely enough, I do find myself favoring different musical genres depending on if it's applied or literary art that I'm working on. I seem to listen to more bebop, jazz-electronica, and classical while engaged in the various tasks of technical writing: editing text, illustrating, editing photos, consolidating interview notes, reviewing wiring diagrams for lines of functionality, and so on. Science fiction and fantasy are more frequently accompanied by pure electronica, ambient, and film or series soundtracks. Though not quite so much when it comes to actually writing new text. For creation in either field, silence is best. "More often than not," he mumbled, listening to "Angel of Loll" for the fourth time as he wrote this post. Wired has a thought-provoking article posted about practical artificial intelligence and its applications -- one written by founder and long-time senior editor, Kevin Kelly. The main thrust is that practical artificial intelligence has reached an emergence point. Several maturing software technologies are converging, allowing pattern recognition, language-parsing, deductive reasoning, and machine learning functions to be add to consumer and enterprise applications. A new generation of AI enhanced applications are drawing serious seed and Series A funding in Silicon Valley. Interestingly, the new AI is not a big box, single-engine program or specialized hardware platform. Instead, IBM and others are offering its functions as scalable cloud utilities. Rent or buy and infuse as much of these capabilities into your processing as you need. I suspect the mega hit application that really sells this practical multi-threaded cloud AI is probably one that we can’t predict at this time. If I had to bet, though, my wager would be that the first majorly profitable application will be in enabling software to interact with people through natural language. Something along the lines of conversationally asking a search engine via phone for a list of local coffee shops with high ratings, the hours and location of the best sounding one, and real time directions -- all without glancing at the screen or resorting to commands. Or, to put it differently and drag a related field of hardware and software into the mix: The ultimate in augmented reality is probably an AI-enabled hands-free audio interface that allows users to operate with a minimum of distraction or invested focus during life’s daily tasks. Ask questions, get answers, and develop any further lines of inquiry conversationally. Hopefully with software that can anticipate relevant complications. As an aside, I suspect that the most common civilian uses of visual augmented reality will probably be for sit down problems that demand a high degree of focus and persistently displayed information. So that’s the pragmatics of what's kept me fascinated with this article. Much of it has been bouncing around as individual threads in software development circles for some time. Kelly, however, does a solid job of synthesizing some of the major elements and thinking about where they might go taken as a whole. Science fiction author and technical writer. Also a former Army scout and past research technician in organic chemistry and bio sciences. 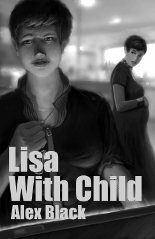 A novella based on the award-winning short story "Lisa with Child." Available through Amazon.com. Available from Amazon.com, Powell’s, Apple's iBookstore, and Barnes and Noble, and other major venues in mass market paperback and ebook.